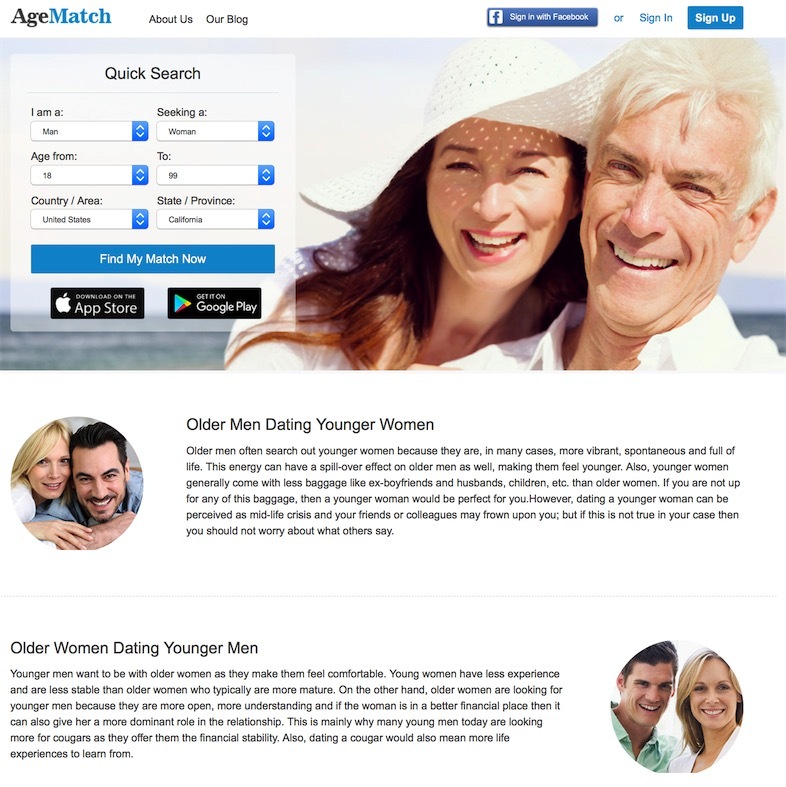 AgeMatch.com is the best online platform for people looking to date older or younger partners. It is the #1 site among the other five age gap dating sites we have reviewed. The website has a large member base consisting of matured older men, cougars, beautiful girls and young lads. AgeMatch.com has unique features that help users to find their perfect match and establish a relationship with other age gap singles. AgeMatch.com website has a user-friendly interface that makes age gap dating look simple. On the homepage, you can register for free by filling in some of the basic information like gender, age, country and the state. The site also allows users to sign in through their Facebook account. After signing in, users can create a profile by describing about yourself with a simple headline and the type of partner you are looking for. You must also fill a simple questionnaire based on appearance (height, hair and eye color), background (religion, education) and lifestyle (occupation, annual income, habits) to build your profile. The website allows its users to mention additional information about themselves such as hobbies, interests, relationship status, history, first date ideas, likes and dislikes. It also enables users to upload photos and a short video description or introduction to attract potential matches. Members can search for potential older or younger partners on the website based on various criteria like location, username, newest members, compatible matches and reverse matches. It allows you to use certain features for free while upgrading to a gold membership can help get much better attention and matches. AgeMatch.com has a dedicated community for its members to build a rapport with other users. Users can share their advice, views, problems about age gap dating through blogs and forums on the website. Both free and premium members can access Age Match blogs and forums. The forums are based on two main categories namely, younger women dating older men and older women dating younger men. If you are a free member, you can create profile with photos, describe about yourself and the type of partner you want, browse through members profiles, search based on your location/state/ city and search members in specific age group. You can show your interest by sending unlimited winks and respond to emails sent by gold members. Free members can also chat with interested people, know who viewed or showed interest in your profile, like and comment on other’s profiles, plan first dates and describe your ideas and experiences on the dedicated forums. For enjoying its other interesting features, you must get a gold membership by paying a premium of $29.95 a month. Users can upgrade their profile by paying the money through PayPal, Credit card, Debit card and Bank Check. It’s worth the cost as gold members are fully allowed to use its innumerable features to filter and find their potential partner. Gold members can initiate mails and chats, set up photo/profile privacy settings, manage email/wink settings, hide log in time and date, hide activity, view compatible matches and reverse matches. AgeMatch.com is one of the leading dating websites for ageless romance. With more than a million users, the website has broken the barrier of age gap differences by encouraging men and women to find their dream partners at any stage of their life. If you specifically want to date partners outside your age group, then AgeMatch.com should be the first website on your radar. Copyright © 2016 Age Gap Dating | All Rights Reserved.